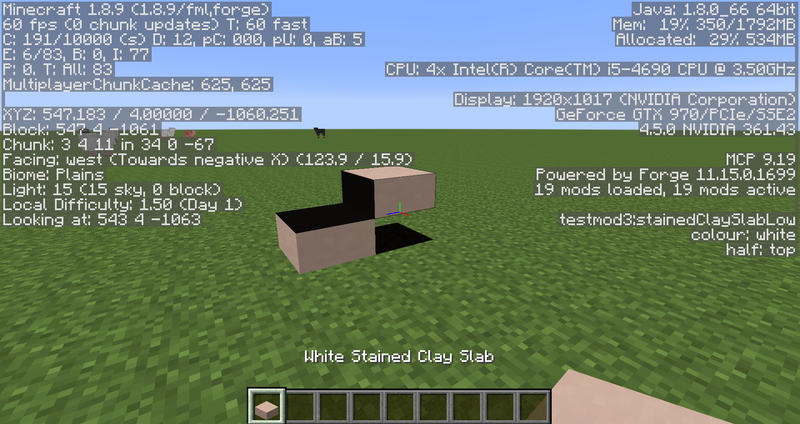 I've added some slabs that use the Stained Clay textures, but the half slabs are rendering completely black in the half they don't occupy (screenshot). The item models are fine. property's value, so my slabs should render correctly without having to specify that. Am I doing something wrong or missing something obvious? Sounds like lighting is failing on opacity. Therefore, your face may be "rendered" but not illuminated. Is the dark face always the "interior" face (halfway plane of the cube)? -- Interesting screenshot. Light is not getting into the empty part of the cube. It could be tricky to fix because slabs themselves had a lighting bug for a while (the underside of a half-slab being as dark as the top face even if there was a light source right under it). There was a "fix" sometime between 1.8 and 1.8.8 that I haven't read yet. If you can find what changed, then you might find the problem. Do vanilla slabs act differently? I wish I could be more help, but the more I think on it, the more it looks like something new and not a form of the bug I had seen before. I tried to trace the appearance and use of "isDouble", but I got lost. There's a constructor for BlockColouredSlab that takes an isDouble parameter but does not seem to use it. You might need to break out the debugger to see what is being returned from calls to isDouble() methods at various stages. In what Vanilla code I can see (1.8 ), half stone slab and half wood slab (and the full slabs) are each a simple extension of BlockSlab. Yours is not so simple (seemingly combining all possibilities into one extension of BlockSlab), so there might be a timing problem during initialization. Set a breakpoint on the instantiation of a problem variant and trace its construction & initialization. There are three of these Enums: SOLID, TRANSLUCENT, CUTOUT. (There is also CUTOUT_MIPPED, but I am not sure how that one works). This simply means the block is transparent. Block#getRenderType is required for slabs I believe, but you need that too when using the boolean above. Hope I helped! constructor argument was a leftover from my earlier attempts, I've removed it now. Vanilla slabs are rendering without issue, it's only my slabs that have the lighting problem. and overriding that method does nothing to fix the problem regardless of which layer I return. , which I already override to return the appropriate value. only needs to be overridden if you want to use a different renderer to the parent class, which I don't. Both Vanilla slabs and my ones use the baked model system (blockstates file + models). Well, I got my transparent block to work be returning CUTOUT, and a render type of 3. It's worth a try, even if you do not see it in vanilla classes. or my slab classes override it. Then, you just call it as "#[texture number]" (in quotations, if you didn't already know). It could perhaps be a UV error, but this is unlikely. Oh my God! I thought you were attempting to make Stained Glass slabs, not Stained Clay. Sorry on my part! I was looking at some posts with similar issues, and they all said doing "this.useNeighborBrightness(true)" fixes the rendering issues. Haven't tested it, so I'm not sure. But it's worth a shot. There is a really nice tutorial I found here. They only use the neighboring block's brightness if it is not double, so that slightly confirms it will work. Also, they seem to setup their model file WAY differently than yours. Give it a look, and see if it helps! before mods are loaded. You'd think it would do this in the constructor of the appropriate classes. My slabs now render properly. Glad I could help! Sorry about the confusion earlier, happy modding!